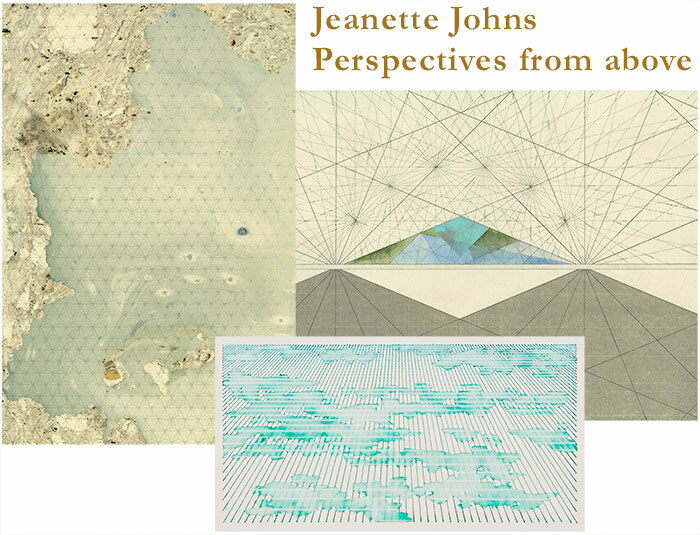 "Jeanette Johns brings her interest in patterns, plane geometry, and one-point perspective to her visual arts practice. She perceives patterns as a visual form of mathematics. Johns explores the mechanical aspects of offset lithography by deconstructing maps from ancient atlases. Johns reflects on the experience of space, the symbolic presence of the horizon line, and the viewer’s position relative to the vastness that surrounds us. She refers to the sky as a visual representation of infinite space. She draws a relationship between topographical landscapes and geometric patterns, as a means of revealing their ordered construction." ~ Jim Riley, independent curator. © Excerpt from his essay Perspectives from Above, Centre3 for Print and Media Arts, 2014.